Bathroom renovations can be time-consuming and expensive, especially when you want to change multiple things. According to the National Kitchen and Bath Association, the average cost to renovate the bathroom is $17,735! For some, this can be discouraging and lead you to keep your boring bathroom the same for years and years. But by thinking outside of the box and making small but meaningful changes, you can you can remodel your bathroom without flushing your money down the toilet. The important thing to remember is that you can (and should) splurge on select items and save on areas that are less important. Here are four cost effective bathroom remodel ideas to renovate your bathroom on a budget. If you have a small bathroom, adding a statement piece of furniture like a linen cabinet or shelf can do so many things to help improve your bathroom. 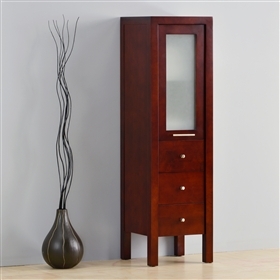 A great accessory, like our Linen Cabinet London 17, acts as a centerpiece for your room so you can distract your guests from the rest of the area. Also, by placing your furniture piece in a good location, you’ll not only have a great accent piece to show off, but you’ll also have more room to organize your things. Bathroom clutter can ruin even the nicest bathroom, but by having an enclosed storage space, you’ll have a place to hide all of your stuff and it’ll look great while doing so! Painting your bathroom is a great and simple way to make your bathroom unrecognizable. Take down that outdated wallpaper or change up the colors to make your small space feel more open and modern. Neutrals like brown and grey are great colors for your walls and can instantly make your bathroom look better. If you’re feeling particularly bold, paint the wall where your sink is against an accent color like cream or white, to make your sink stand out and your other colors more prominent. This tip is one of the best-kept secrets in the bathroom remodeling world. If you’ve ever cleaned your grout lining, you know how different your shower looks before and after. It’s truly amazing what a little scrubbing and lining can do to rejuvenate your appliances and make it look new. Use a hard-bristled brush and mildew cleaner and scrub away for a fresh-looking shower and bath. When some people think “bathroom renovations”, they automatically assume that means updating your shower and toilet. But if you have a limited amount of money that you’re working with, that alone can bust your budget. Thinking beyond the centerpieces of your bathroom, replacing your faucets instead of all of your appliances can really go a long way to improving the look of your bathroom. 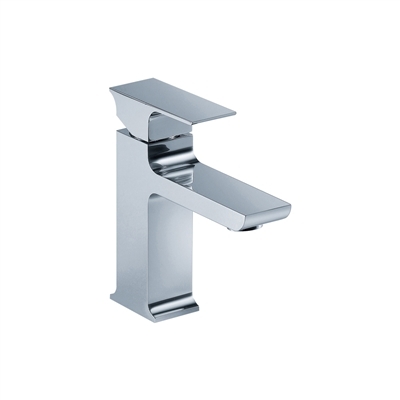 Our faucets, like the Ivan Basin Faucet, are easy to install and are affordable, so you can splurge on some modern-looking fixtures without spending your whole budget in one place. Using these bathroom makeover ideas, you can create the bathroom you’ve always wanted without spending a fortune. Bathroom Place is dedicated to giving you the best selection of products at a good price. Shop through our faucets, cabinets and more and get started on creating your dream bathroom! Bathroom remodelling is really expensive.Thanks for sharing this money saving suggestion.If you are looking for residential remodel contractor mn, then you can contact Oxbuilders.net for more details.